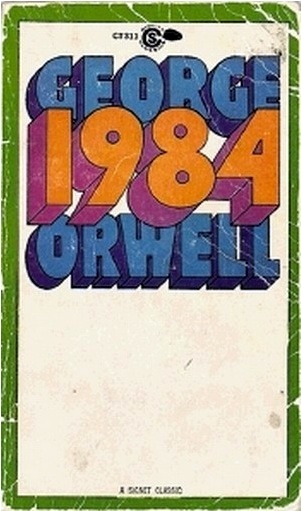 With all the spying stuff that’s been in the news the last few months, the comparison to Big Brother from George Orwell’s 1984 has been on my mind a bit, and it got me to thinking about my own little experience with Mr. Orwell. …and I managed to talk my way not only into playing Mr. Charrington on stage when that actor quit, but because of my voice and ability to do accents, I had also been chosen to play the voice of Big Brother, (deep, ominous, with slight Russian accent), the voice of his arch nemesis Goldstein, (high, kind of a German accent with a little Yiddish thrown in) and on a closed circuit screen, the “Telescreen” News Announcer. The good part of this? I got to play 4 parts in the play. I had to play 4 parts in the play. The biggest challenge to doing them all was getting from the tiny little studio we had set up to the right of the light booth, in the back of the auditorium, where all the equipment for all the closed circuit “Telescreen” shots was, and getting into costume, makeup, into character and up onto the stage. Once there I had to get into a Cockney accent and look and act much older than the Telescreen announcer I’d been a couple of minutes before. The reason this was “the bad part” wasn’t that I couldn’t do the parts. I spent the first part of the play in the windowless camera booth at the back of the auditorium, then had to get up, cross the light booth, out to the hallway, run down that hallway till I could get backstage and get into makeup, all without making so much noise as to distract the audience. This didn’t really come up until the last few rehearsals, which were full dress, right after school. That was when we discovered that there just wasn’t enough time to get the costumes changed in the time I had. So on the second dress rehearsal, I planned on getting changed up there in the windowless camera booth, before meeting everybody on stage for the pre-rehearsal meeting where they were all gathered around the telescreen that was in the middle of the stage. Except I got there late. And I had to hurriedly change in the only space available in the little studio beside the light booth, that being between the News Announcer’s desk and the camera. The one with the little red light on it when it was running. It was then that I noticed the red light was on. Big Brother was indeed watching me. So I did the only thing that made sense at the time, given my condition (half dressed) and position (in front of the camera). And then I mooned Big Brother. And then I turned and took a long, exaggerated bow. But it got me thinking… It reminded me that even in the smallest things, people are watching; your kids, your colleagues, your friends, and how you handle yourself when you don’t think people are watching is just as important, if not more important as when they are.